For an updated version of this lens with image stabilization, a closer minimum focusing distance, reduced flare, and updated aperture mechanism, see the Canon EF 70-200mm f/4L IS USM II Lens. The Canon EF 70-200mm f/4L USM Lens is a lightweight telephoto zoom that provides very high quality optics in a size suitable for travel thanks to internal zooming and focusing. A focus range limiter allows you to set a particular range of focus which enables shorter focusing times - a great option when you know exactly how far away a fast-moving subject is that you are trying to capture. This lens is suitable for stadium events and ceremonies, wildlife photography, sports shooting, and portraiture in large spaces. 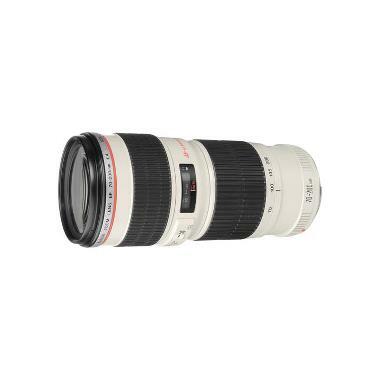 For this same lens but with image stabilization, see the Canon EF 70-200mm f/4L IS USM Lens. • This lens does not come with stabilization. Please see the Canon EF 70-200mm f/4L IS USM Lens for this same lens but with stabilization.